"Members officially detailed to the services by the Department were paid for their regularly scheduled on-duty hours. "Please be advised that there is no specific City directive or legal citation [stating City funds will be spent for cops to attend funerals in other jurisdictions]. However, as a City department head, Chief Suhr has the authority to detail, assign and schedule employees to attend events, training and meetings. "There were no additional related costs using City funds. 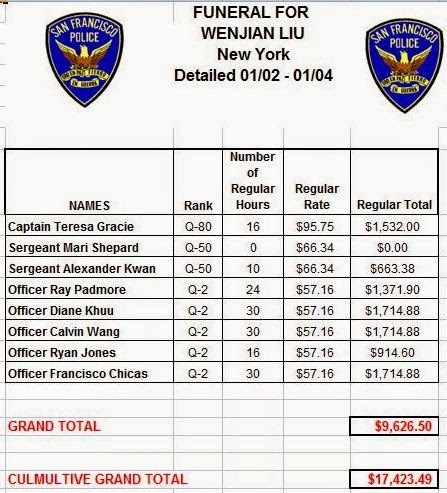 Members detailed by the Department were responsible for their own transportation, lodging and meals and could seek reimbursement from the San Francisco Police Officers Association (POA) for their expenses." 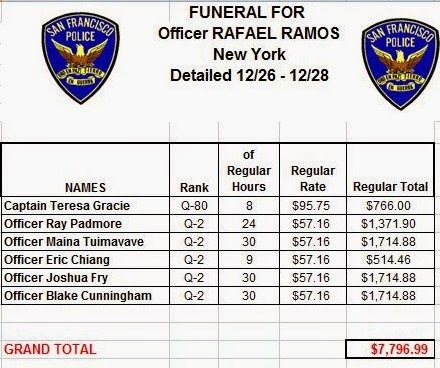 San Francisco paid out $7,797 for six personnel to participate in the first NYPD funeral and $9,626 for eight officers' attendance at the second funeral, for a grand total of $17,423. At a time when politicians and the police force are saying they need more cops on the streets of San Francisco, should we be spending City funds to send 14 officers to the Big Apple?